It is important for Norway – and an international commitment - to take care of the European wild reindeer and the values it represents. The term wild reindeer does not just refer to the actual animal, but also covers a wide range of ecological and cultural processes that we associate with the species, which was a key resource in European culture for thousands of years. A wild reindeer is a wild reindeer when he can live in large herds and roam over large areas, use a variety of foraging habitats, and be part of human experience and harvesting. The Wild Reindeer and Society project is a broad-based project on the challenges facing future management of wild reindeer. The objective is to obtain a knowledge basis that provides us with an indication of what should be done to safeguard the future of wild reindeer as a species, as a source of experience and as a harvesting resource. The advisory committee submitted its recommendation in 2004. Elevating the wild reindeer from a special interest to a concern for society as a whole. Increasing the focus on land management. Putting an end to piecemeal management. Ensuring larger continuous habitats for wild reindeer. Paving the way for sustainable value creation. The project proposed establishing ten national wild reindeer areas. To underline Norway’s international responsibility, the project also proposed establishing two European wild reindeer regions. These national areas and European regions are now established, and are explained in the map above (click for larger version). 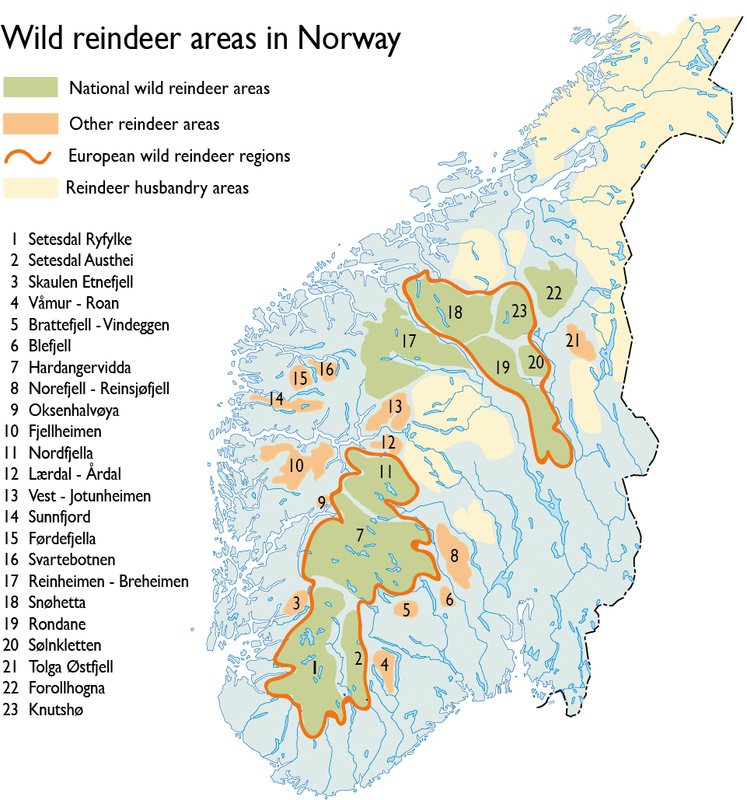 Through focusing on safeguarding the habitats of the wild reindeer and increasing people’s awareness of the value of the wild reindeer, we hope to ensure that the mountains of Southern Norway will continue to provide refuge for viable populations of Europe’s wild mountain reindeer in the future.